An End to the “Lost Decade” in Japan-North Korea Relations? Japanese Prime Minister Shinzo Abe has been taking steps to ease tensions between the two East Asian neighbors. 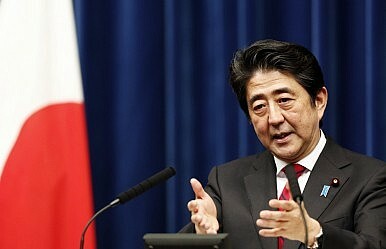 Shinzo Abe’s return to the post of prime minister was accompanied by growing tensions on the Korean peninsula. North Korea fired its long-range missile Unha-3 (for the alleged purpose of sending a satellite into orbit) in December 2012, and this was followed by a third test of a nuclear device only two months later. The renewed crisis these provocations triggered offered few prospects for progress in the stalled Japan-North Korea talks. Yet, while North Korea continued with its military tests, Abe tempered his hardline policy toward Pyongyang and moved toward resuming talks with the North Korean leadership. This has restored hope for progress in normalizing diplomatic relations between the two countries. What explains this change in Abe’s approach toward North Korea? Now, however, the Abe administration has embarked on a course of dialogue with the DPRK, despite the tensions arising from the North’s recent provocations. This shift in Japan’s DPRK policy was marked by the well-timed dispatch of senior Abe advisor Isao IIjima to Pyongyang in May 2013, shortly after tensions eased over the North’s missile deployment. Thus, while Abe joined the U.S. in intensifying pressure on the North through economic sanctions, Tokyo has also tried to calibrate its policy between dialogue and pressure and to keep the door open for Pyongyang. As a result, Japan and North Korea agreed to resume a dialogue in March 2014, after the last round was suspended in late 2012. This advance was the result of careful Japanese diplomacy that involved a series of secret meetings with North Korean officials since October last year. It is likely that these were initiated by Abe adviser Iijima, who visited the Chinese port-city of Dalian in October 2013, where according to media reports he met with North Korean officials. Dalian is frequently used by Japan for secret talks with North Korea. Further talks were held in January and February in Vietnam and Hong Kong, opening the path for an informal meeting in Shenyang, held at the sidelines of a gathering of the two nations’ Red Cross societies in March. The current momentum of Japan-DPRK diplomacy has resulted in the reunion of the parents of Megumi Yokota with their North Korea-born granddaughter Kim Eun Gyong. Abducted at 13 in 1977 from the coast off Niigata, Megumi has been the poster child of the abduction lobby. While her parents had long refused to meet with their granddaughter, the shift occurred as the Abe government is willing to alienate the key organizations of the abduction lobby. With the Yokota family willing to cooperate with the government in the course of a new DPRK policy, the symbolic value of the abduction issue is likely to decline. At the same time, the Ministry of Foreign Affairs (MOFA) has regained control over the management of Japan-North Korea relations, installing a new sense of pragmatism in Japanese foreign policy. Key to this has been Abe’s willingness to put MOFA officials in charge of the Headquarters for the Abduction Issue and thus control of government relations with the abduction lobby. Finally, Abe’s willingness to move forward is illustrated in his cautious response to the North’s mid-range missile tests in April. While in previous years these tests were countered with a high-profile deployment of Japanese defense measures including PAC-3 missile launchers, recent defense measures were taken without informing the public in an attempt to avoid increasing tensions with Pyongyang. For North Korea, there are two possible reasons for accepting rapprochement. First, there is the hope of a lifting of economic sanctions and the inflow of Japanese humanitarian aid to improve the ailing North Korean economy. Second, Pyongyang has been concerned with the loss of the Chongryon headquarters in Tokyo, which had served as North Korea’s quasi-embassy in Japan and a key source of cash. The North Korea-sponsored network of ethnic Koreans in Japan has lost significant influence over the last two decades since the organization suffered massive financial problems in the 1990s. As the Japanese government bailed out Chongryon’s affiliated credit unions, the Tokyo District Court has ordered the sale of the property in central Tokyo to recover the organization’s debt of 62.7 billion yen. In March 2014, the building was purchased by the Shikoku-based firm Marunaka Holdings, which originally operated a chain of supermarkets. It remains unclear how serious the North Korean leadership is in its call for a halt to the sale of the headquarters, as any decision in that regard would require an intervention by the Japanese government in ongoing court proceedings. Still, since Abe appears to be willing to improve relations with the North, trade-offs seem possible as Pyongyang did respond to the key Japanese demand of resuming investigations into the abduction issue. What appears likely for the months ahead are talks on the resumption of charter flights connecting the two countries as well as discussions about the resumption of international ferry services between the cities of Wonsan in North Korea and the Japanese city of Niigata. In sum, this would clearly indicate an end to the “lost decade” in Japan-North Korea relations. Sebastian Maslow is Research Fellow at the German Institute for Japanese Studies Tokyo (DIJ). His research focuses on Japan’s foreign and security policy. The Art of the Balance: Japan, China and the United StatesWill Japan and Russia Finally Settle Their Territorial Dispute?A New Cold War With Russia Forces Japan to Choose SidesHow Putin Outplayed Abe in JapanTaiwan Elections: An Opportunity for Japan?